Nine students at Fisk University and Tennessee State University are suing the state of Tennessee over their voter identification laws that deny college students from using their student IDs to vote. Over the years, Tennessee’s strict voter ID laws have received strong support with lawmakers arguing that college IDs are easier to fake and harder to verify as authentic. “More than anything, the lack of uniformity between school IDs across the state would create a tough situation for poll workers,” Cade Cothren, a spokesman for the House Republican Caucus told The Tennessean. But despite the support, HBCU students involved in the lawsuit are arguing that the strict voter laws are a systematic way to shut out young voters. “For four years, The Tennessee General Assembly has rejected every attempt to add college student IDs to the voter ID list, systematically shutting young voters out of the political process just as they become eligible to vote,” said Jon Sherman, a staff attorney for the Fair Elections Legal Network. The Fair Elections Legal Network, which is a national voting rights organization, and the Nashville law firm Barrett Johnston Martin & Garrison, filed the lawsuit on behalf of the Nashville Student Organizing Committee, a social justice and civil rights organization run by students. 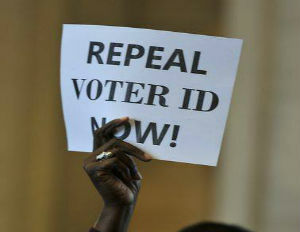 In 2011, Tennessee passed its strict voter ID law which denied students the right to use their college ID to vote, but allowed university faculty to use their ID. Since then, several attempts have been made to add student IDs to the approval list, but each of them have failed. Now, with the involvement of a federal judge, students are hoping for a verdict that will weigh in their favor.